2018 Chair Affair Children’s Chairs – A Sneak Peek! After months of preparation, the 2018 Chair Affair is almost here! One of the most exciting features of the Chair Affair is, of course, the Children’s Chairs: fabulous contributions donated by artists in our community who care about the mission of Community Warehouse. Every year, Chair Affair guests look forward to seeing the outstanding works of art and transformed furnishings created by renowned local artists for the latest series of artistic children’s chairs. By sponsoring one of these fantastic children’s chairs, guests at the event will ensure that a child who visits the Warehouse receives a one-of-a-kind treasure all their own! Months ago, back when Chair Affair was a faraway date- jotted on our calendars, local artists began to visit the Community Warehouse to peruse the donations of the day. They sought out the odd, the broken or lonely among the donations they had to choose from. they took home these chairs, nightstands and side tables in order to transform them into unique works of art. Some took plain or neglected pieces and repainted them with themes like sports, gardening, imagination, and learning. In the case of one children’s chair, the artist covered it in thick black fur inspired by the family dog! 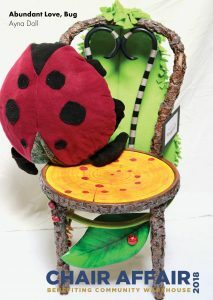 Another piece was unrecognizable as the plain chair it had once been, having been painted, carved and molded to resemble a tree stump overgrown with leafy foliage populated by ruby-red ladybugs! Among the children’s chairs submitted this year, one can find a wide-range of styles and mediums with themes like: The Portland Trail Blazers, figures from iconic children’s literature, a sleeping cat painted onto the seat of a dining chair, matchbook cars, and dinosaurs! Some artists have been contributing pieces to Chair Affair for many years, and every year there are new entries from first-time artists. Several artists are also regular volunteers in Community Warehouse’s furniture bank program and Estate Stores. Artists interested in contributing to next year’s Chair Affair are encouraged to contact Community Warehouse Communications Director Megan Smith. We would love to see what you love to create!